My thoughts are brought back to Jacques Sternberg who must have been quite a character. He was a journalist and novelist, and sailed a small boat in almost all weathers on the English Channel. Jacques Sternberg was born in Belgium in 1923 into a Jewish family. He had a particularly hard time during World War II, taking refuge in the south of France. He began to write short stories, poetry and a diary – and learned to sail a dinghy. His family had to leave the Côte d’Azur and tried their fortune in Spain. They were caught by the Germans in 1943, but Jacques managed to escape during a transfer operation. After the war, Sternberg went to Paris and lived a very poor life, at the limit of being a down-and-out. The American Army took him back to Belgium in October 1944. From 1945 until the mid 50’s, he wrote several novels, but they were refused by publishers. It was during that time that he married Francine, aged 22 years and a Jewish and Communist resistant. Jacques worked in a factory to earn his living. He continued to write novels and found round-about ways of publishing them. From 1956, he ventured into science fiction. In that year, he acquired a Solex, a heavy bicycle with a small petrol engine mounted on the front wheel, which he rode until 2002. He bought his first boat, a Zef, in 1970 and sailed it on the English Channel at Trouville where he lived for six months every year. He went on long cruises along the coasts whatever the weather. He considered crossing the Channel or even the Atlantic or the Pacific in his tiny dinghy, a temptation he wisely resisted. 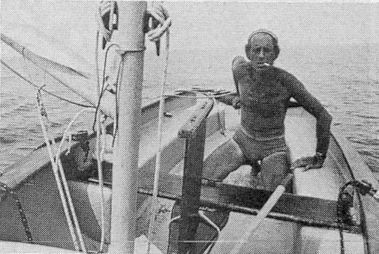 An anarchist at heart, he eschewed the world of yachting clubs and racing, and covered hundreds of nautical miles on the sea. He died of cancer in 2006. My own experience of the Zef is one of a highly seaworthy and stable boat, especially when fully loaded with stuff. I have just been out for two days over the Seine Estuary and back, about eight nautical miles each way. The tidal currents are strong and there are three shipping lanes to cross. The local authorities hate seeing tiny dinghies on such a wide stretch of water with its dangers – and the Gendarmerie de Mer did come and see me, but they didn’t even check the safety equipment I have for up to 6 nautical miles from the coast. I did wonder if what I did was illegal, but I was reassured that it was not. These diligent officers did wonder if a child had wandered astray in an Optimist from a sailing school, since they were observing me from at least ten miles away! As I arrived at Le Havre, I entered port by the port side of the entrance to avoid an oncoming giant cargo ship accompanied by the Harbour Master’s boat. The last three photos were taken by the skipper of a yacht who moored just two places away from me. This situation in Le Havre port looks dangerous, but everything was watched very carefully by the Harbour Master’s boat. I was well to the ship’s starboard beam. I had to row a few strokes as I passed the port wall that took away all my wind. My engine had already broken its propeller spring… So I had to sail into port. The ship is Tamerlane, operated by Wallenius Wilhelmsen Logistics. She is a vehicle carrier weighing 39,401 metric tonnes, and can carry nearly five and a half thousand vehicles. Tamerlane is one amazing piece of modern marine engineering. The starboard entrance buoy at Deauville The port entrance lighthouse and the Casino Sarum beached whilst waiting for high tide and entry into the port The Casino, another life from mine! Returning to Le Havre David and Goliah? The mighty ship passes by under the watchful eye of the Harbour Master’s launch. This entry was posted in Uncategorized and tagged Sailing, The Sea. Bookmark the permalink. Tamerlane and Sarum – not too ominously allegorical, I hope! (I should reread Marlowe…) David and Goliath is a more pleasing exegesis! There is Future without Future in English. In some ways, Sternberg was a sort of Belgian “Orwell” and had a lot in common with Orwell and Huxley. The sailing was only a small part of this guy’s life. He must have been very brave when he escaped from the Nazis who were going to take him to a concentration camp. A colourful character, I would say.